It's rare to see this indoors, but a wonderful surprise, when it does! Sansevierias are members of the lily family, Liliaceae. This bloom has a fragrance very similar to an Easter Lily! Take good care of your snake plant and you may see one of these spring up one day. Low light to some direct sun. Full afternoon sun is too strong. How wonderful it is to have a plant blooming indoors during winter! This one was in a small pot and lived outside from spring to summer. I re-potted it into a 6" diameter pot and it has grown and continued to bloom ever since I brought it inside. It has been quite content sitting in this south-facing kitchen window since early fall. The wax begonia is probably the easiest begonia to keep alive indoors. And they can bloom almost constantly. There are many plants that will bloom indoors during the winter and they really do help keep a place cheerier, which is always a good thing! If you'd like to use them as houseplants throughout the winter, your outdoor wax begonias or impatiens should adapt well. If you have larger plants that won't work inside, take cuttings from them, about 4-6" in length at the end of the summer or early fall before a frost. They root easily in water. Water thoroughly as soon as the top of the soil is dry..
Plants in a 4" diameter pot (10 cm) should use about 1/2 cup of water when ready. In a 6" (15cm) pot, use about 1 pint (almost 1/2 liter) of water. Fertilize regularly for best growth and blooming. A daily mist of water would be helpful. This Parsley Aralia was just picture-perfect and awaiting its new owner that will walk into this florist, sooner or later. This graceful, easy to grow plant is at a stage of growth where it would be best as a table plant but it can become a showy and elegant floor plants as it grows up. This one is great for a narrow space and does not grow nearly as wide as many other floor plants. I own a few Aralias, one is over forty years old now, and rarely have had trouble with them. The secret to keeping them going is to give them a good soak when they need water and find a bright indirect or sunny spot for them. If you ever visit the Polynesian Islands you may come upon one that is living there, naturally. Bright indirect light to some direct sun. Full afternoon sun may prove to be too strong. Directly in front of a north or east facing window will work out well. For all Aralias: Water when the top of the soil is dry. They like a good soak but not to sit in water for long. Fertilize regularly for best growth. Misting daily with water would be appreciated but is not necessary. Once in awhile clean the leaves in the shower or outdoors with a hose on gentle spray. You can mix up about a tsp. of mild dishwashing soap in a pint bottle and soap up the leaves first. As I walked into the florist, this splendid Birdnest fern was sitting on the the penny floor right next to the front door. If growing ferns interests you, the Birdnest fern is one of the easiest ferns to keep indoors. I'd really recommend this for a beginner. It's called a Birdnest fern because its center crown looks very much like it could be a home for birds, although in miniature. It has stiffly spreading fresh green leaves that emanate from its center. 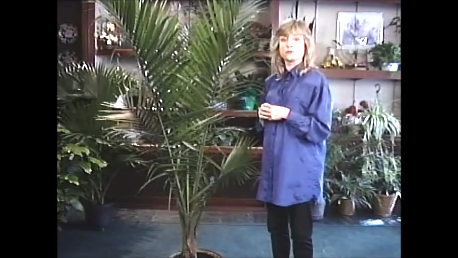 The fronds can eventually grow 3 feet (or 90cm) long so make sure you'll have the space for it. !t will take a few years, at least, for this one to grow that large. Its botanical name is Asplenium nidus and if you are walking through Queensland, Australia or parts of Japan you just may happen upon on one growing naturally there. ~~You can send plants or floral arrangements as a gift, almost anywhere in the world from this great florist: Flowers and Plants Etc. Bright indirect light or some morning sun is perfect. Sitting in a north-facing window is ideal. Ferns must stay on the moist side so give them some water as soon as the top is dry. A plant in a 6" (15cm) pot should take about 1 pint (almost 1/2 liter) of water when necessary. In an 8" diameter pot (20cm), use about 1 quart of water to thoroughly moisten it. Provide humidity for your fern. A daily misting is recommended. You can also put pebbles in their saucer and keep water in the saucer so that the bottom of the pot sits just above water, not in it. The evaporating water does provide some humidity. The Birdnest fern is tolerant of less humidity than some other ferns. Normal indoor temperatures should suit them just fine.